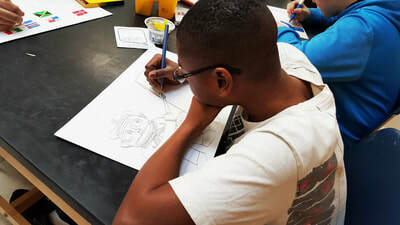 Micah envisions his self-portrait with a pencil drawing. 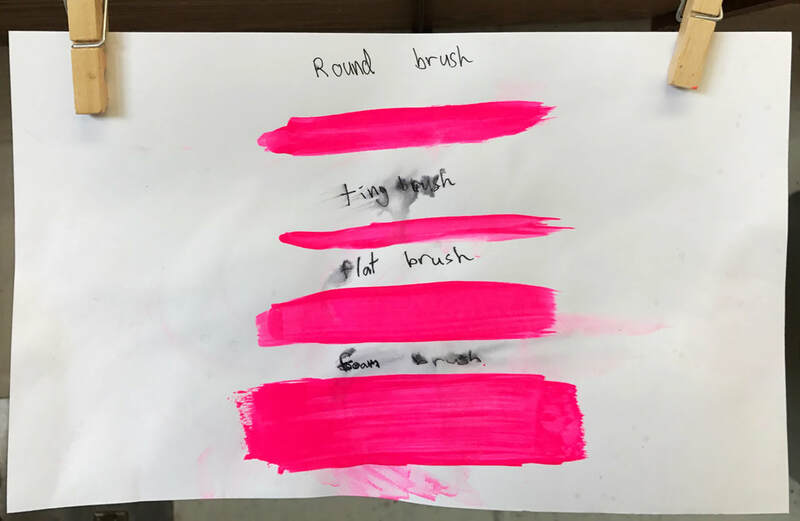 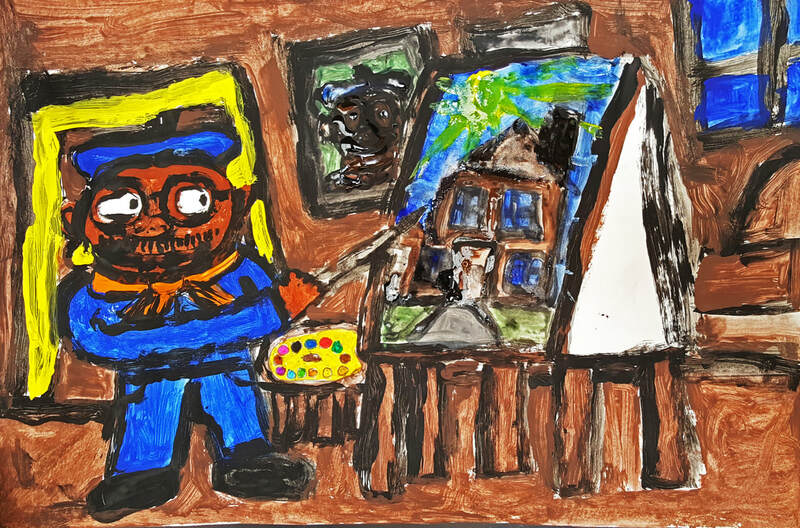 All eight studio habits were evident during the process of Micah’s self-portrait. 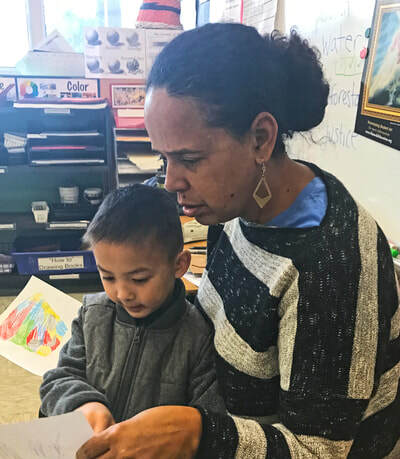 Christine Phillips assists a first grade student as he returns materials to the right places. 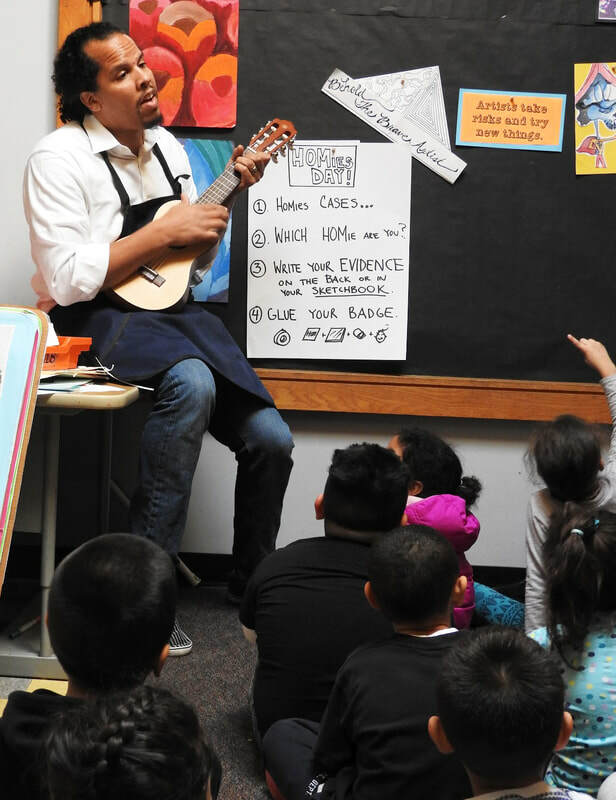 Demetrius strums his ukulele while singing the theme songs he wrote for each HOMie character. 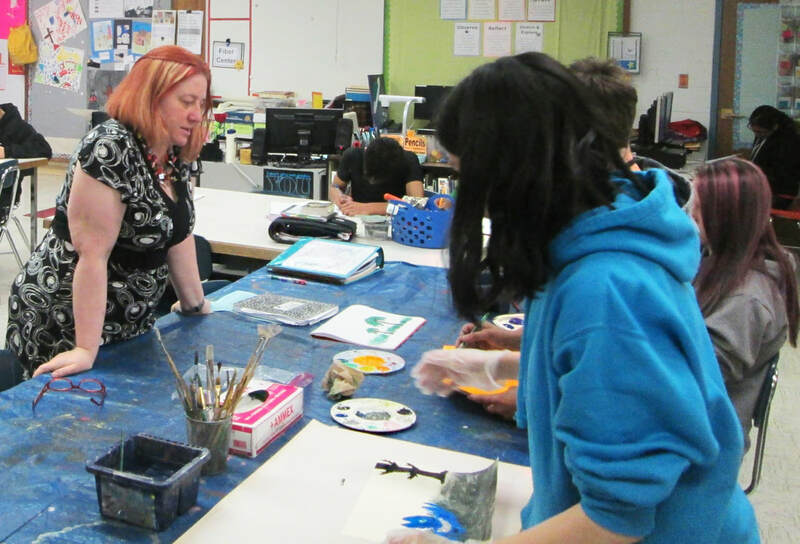 Roni talks about imagination and envisioning with her students. 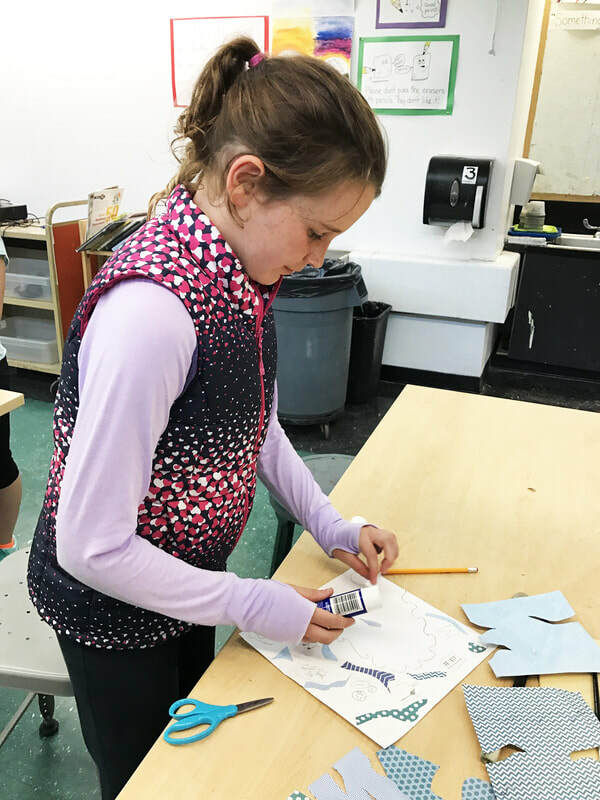 Daphne works on constructing her collage. 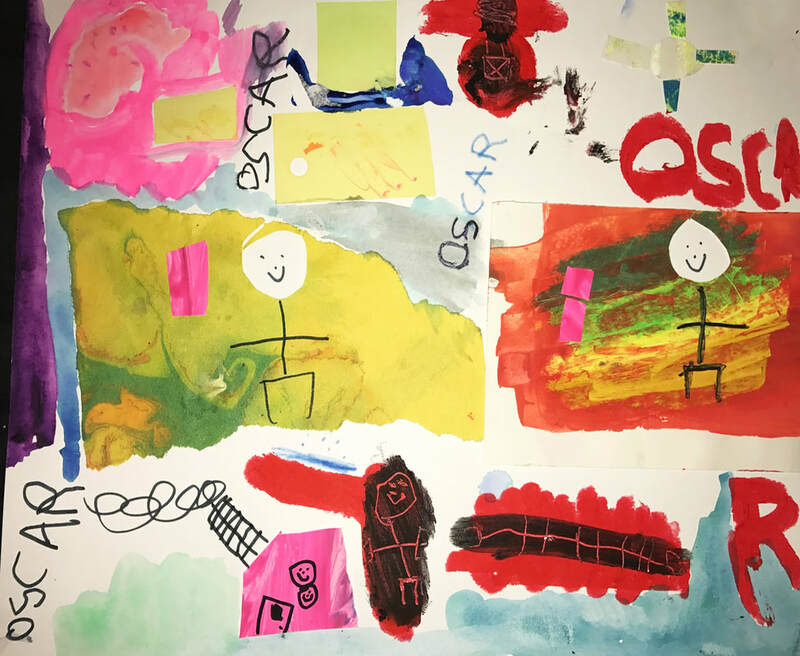 Daphne’s completed artwork shows a coat of arms. 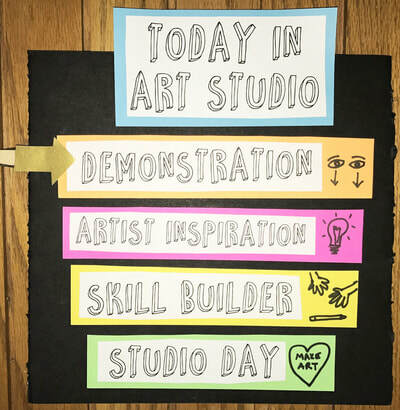 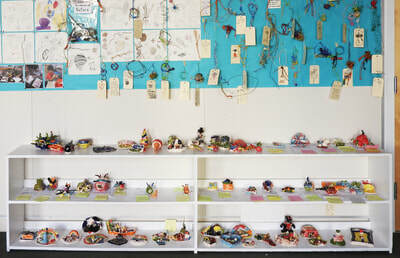 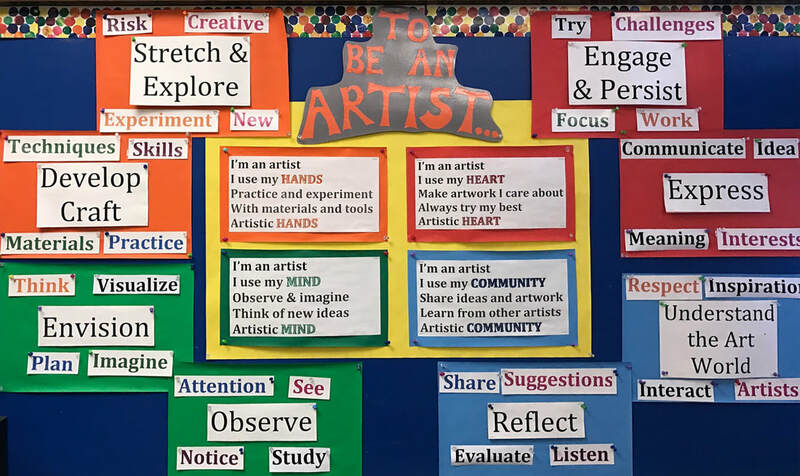 Chrissy stands in front of her wall display of Studio Habits which includes student-created definitions, prompts, and visual depictions of each habit. 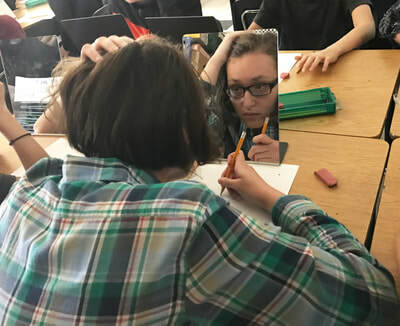 Student Jovana observes herself carefully in the mirror while creating a self-portrait. 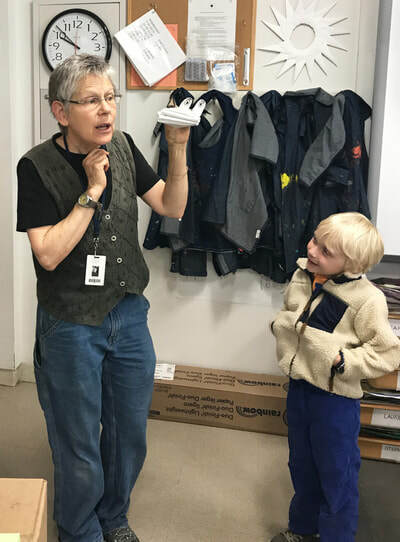 Anne models Talking about Art with her puppet, Sproing. 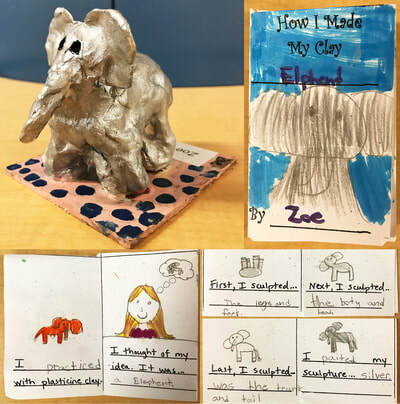 Fourth-grader Hannah writes and draws the steps of making a clay pot in her mini-book. 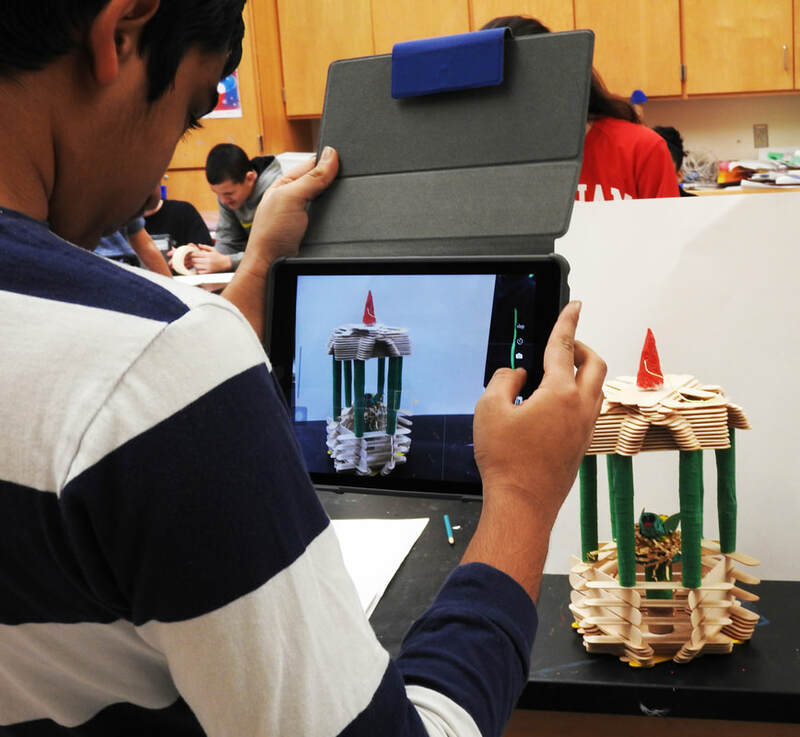 A student determines that his work is finished and uploads a photo to Google Classroom. 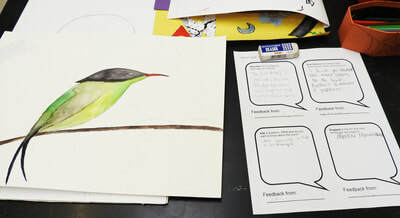 A painting and feedback sheet are displayed in the Gallery Walk. Cynthia Gaub talks with students who are exploring watercolors. 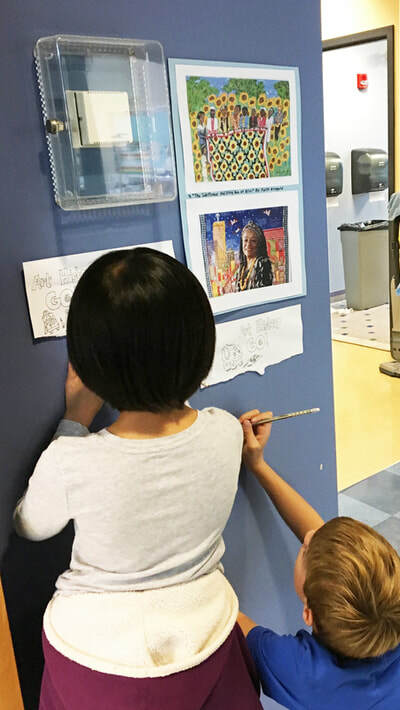 Students fill out their cards in response to artwork on the wall. 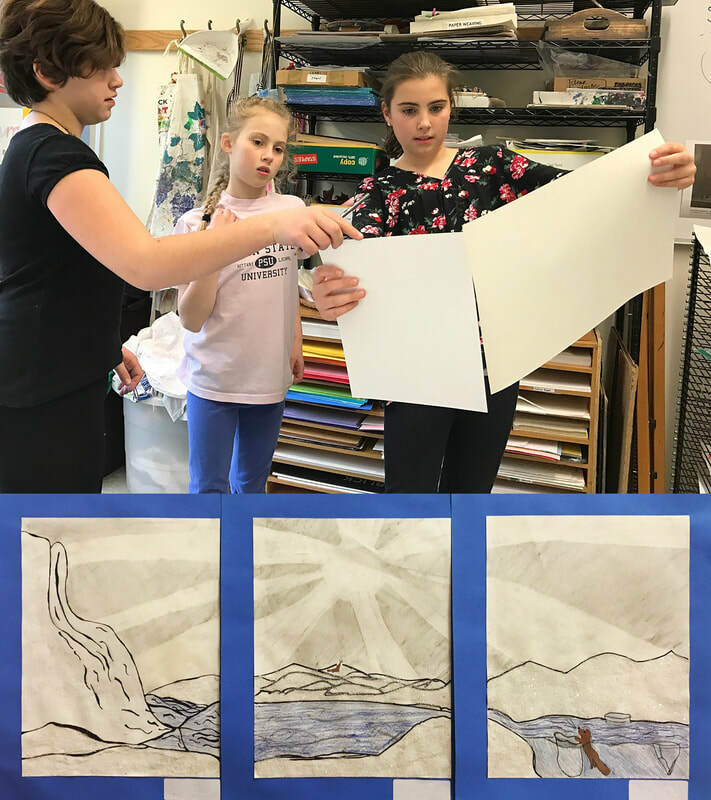 Bella, Grace, and Katie observe their artwork, The Melting Polar Ice Cap, which is later exhibited at the art show. 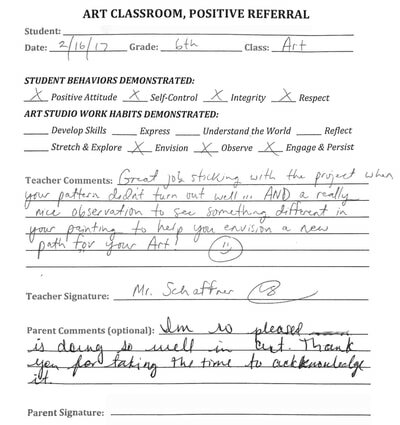 We regret that a quote in the box on page 35, Reflect: Evaluate - Artist Connections is misattributed to Laurie Anderson. The quote, from the Arts 21 video, Memory (2005), is by Susan Rothenberg. We apologize to both artists, and encourage teachers to incorporate the work of both of these terrific artists in their classrooms. 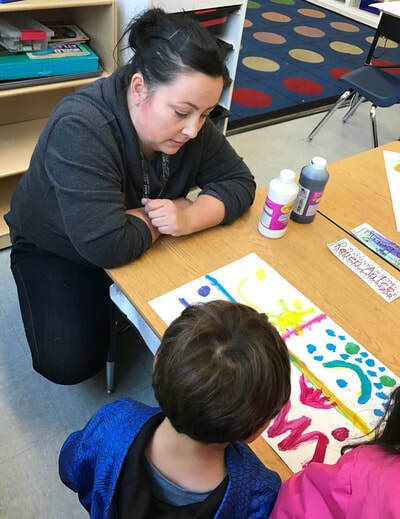 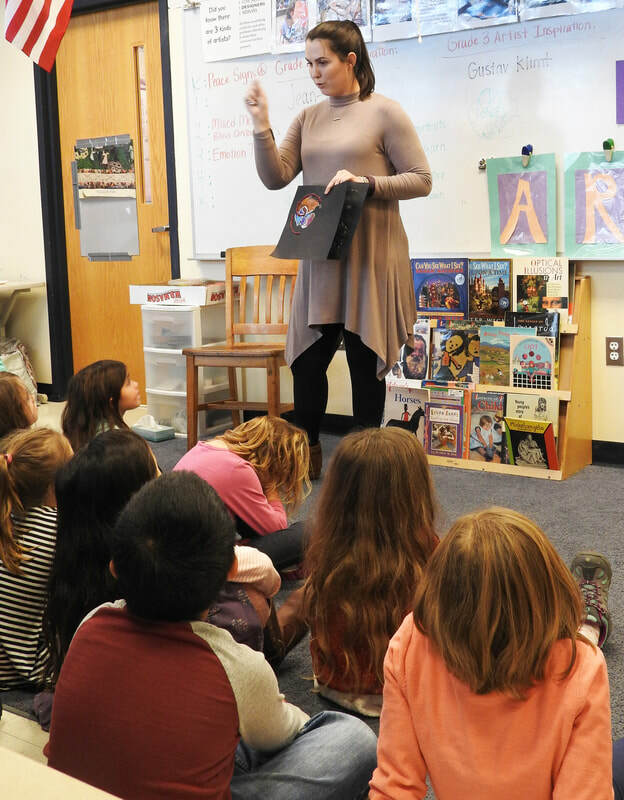 Samantha Kasle introduces an artist’s work to her class. 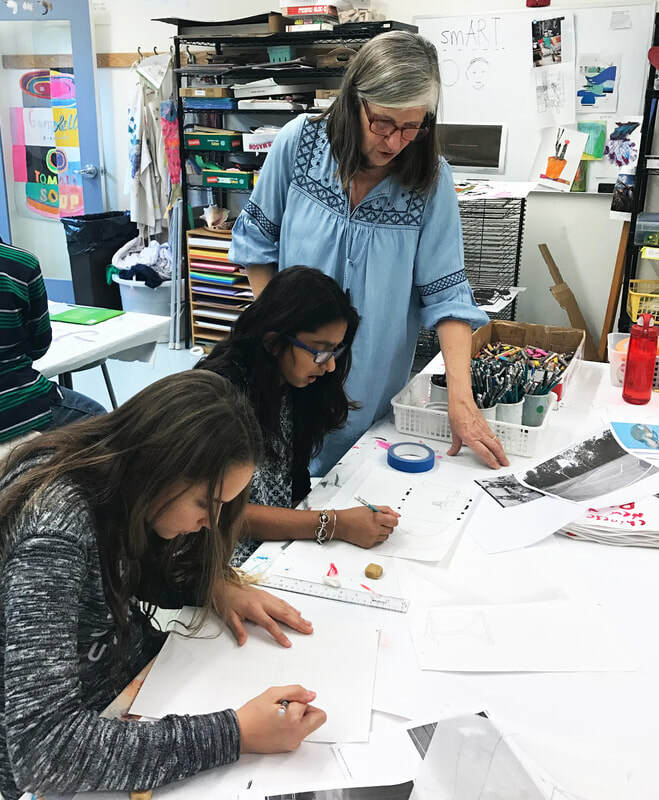 Catherine Karp talks with 5th graders about their sketches. 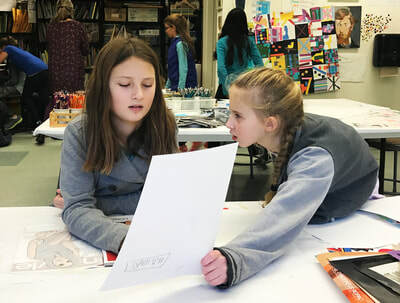 Students Eleanor and Grace discuss their in-progress artwork. 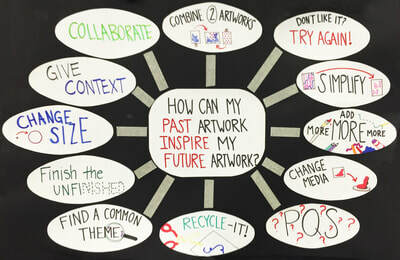 Student artworks are displayed throughout the San Francisco Friends School, along with peer comments on sticky notes. 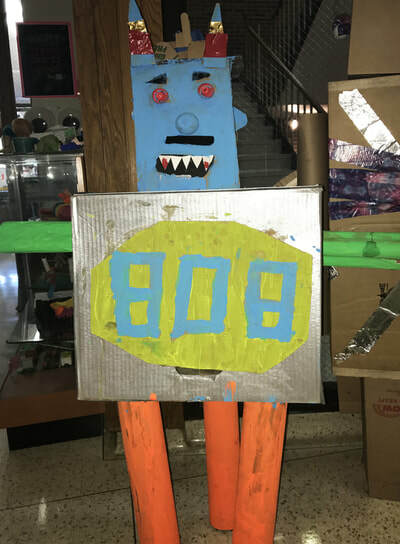 Bob, sculpture by David, Henry, Leo, and Theo. 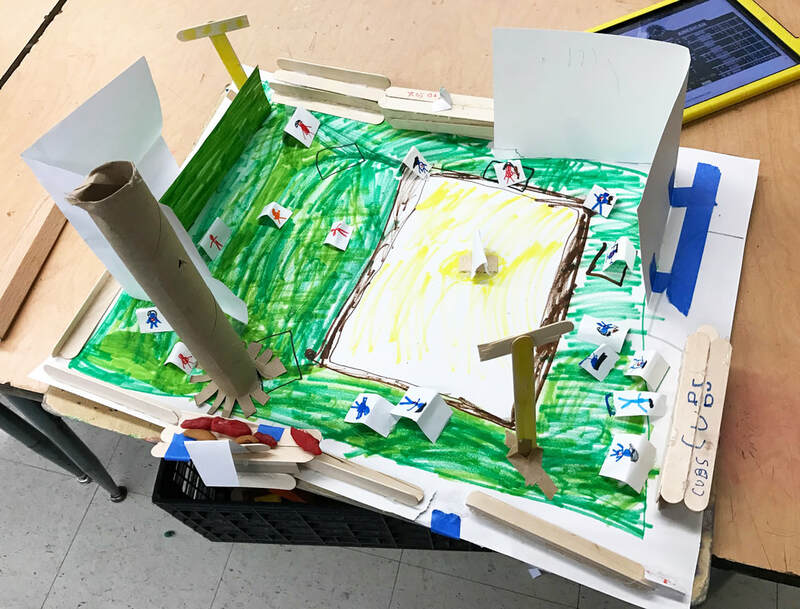 Second graders Julius, Felix, Noah and Micah worked on a replica of Wrigley Field during the 2016 World Series. 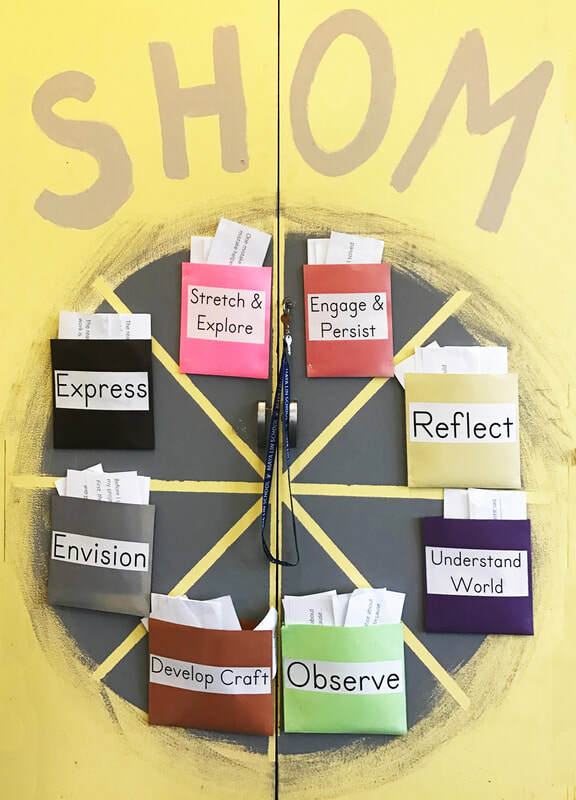 Julie’s students know where to look as they arrive so that they know which routine to follow. Julie’s students create signs for their own and their peers’ reference. Students know what separates a time- and effort-intensive W.O.W. 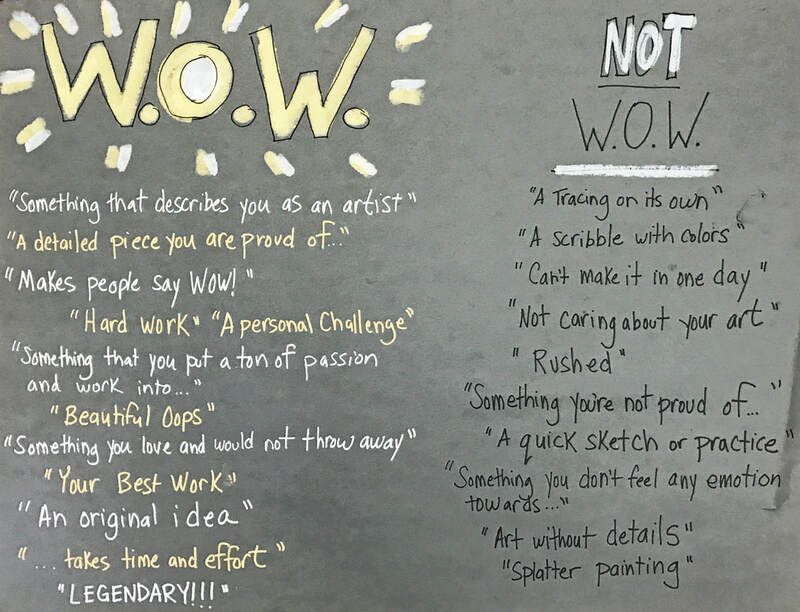 work from other types of artwork. 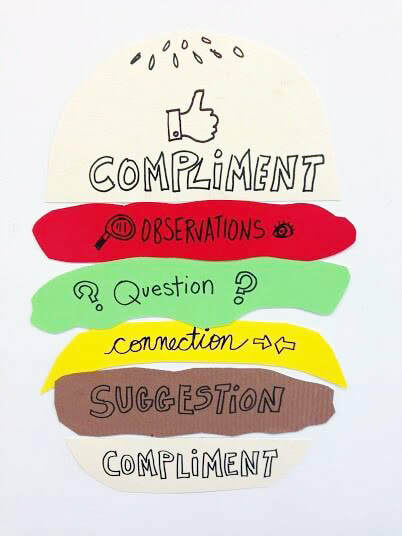 Julie Toole’s Critique Sandwich lets the artist choose the types of responses they welcome from their peers. 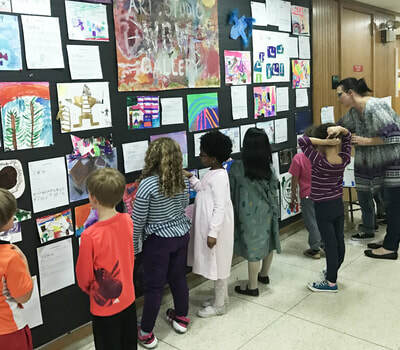 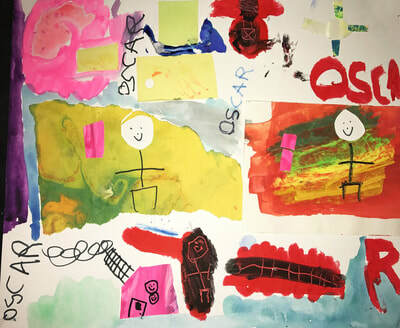 First graders view the hallway gallery with their own and their peers’ work. Julie provides forms for students to complete artist statements. 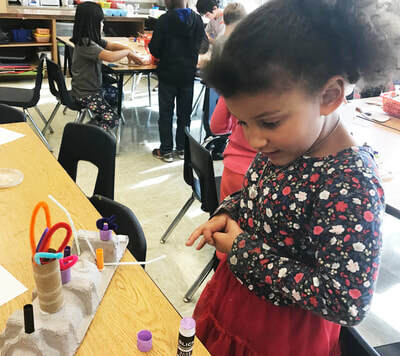 Celia shows her threaded needle for weaving. 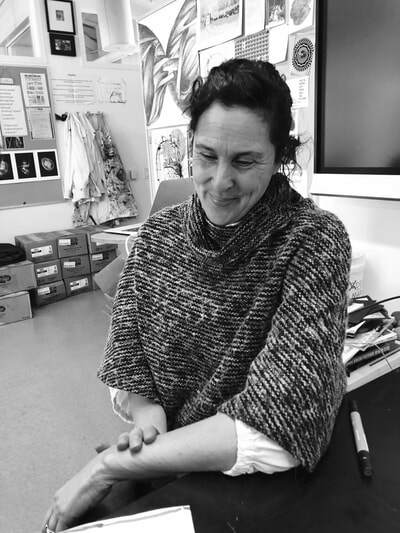 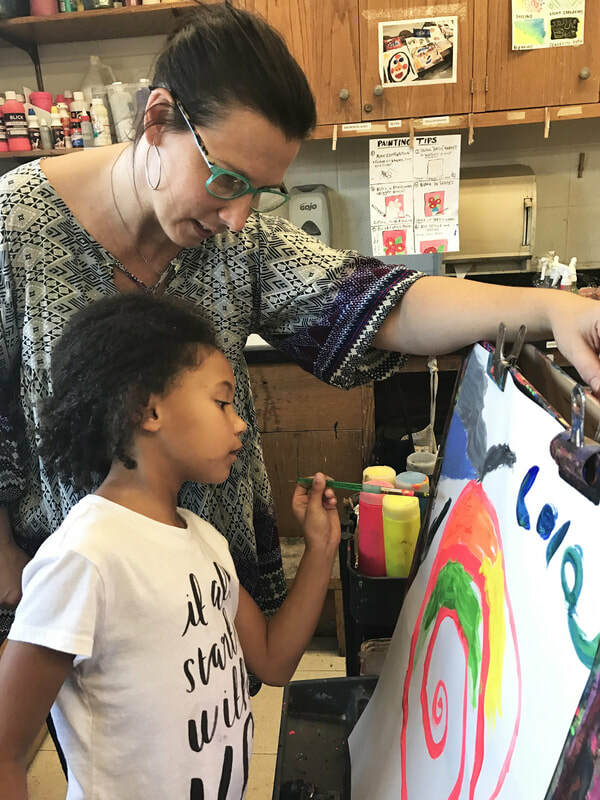 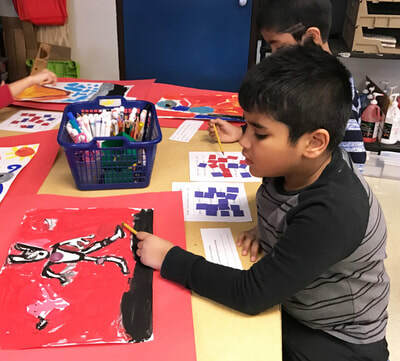 Celia displays how each of the Studio Habits helps student-artists use their artistic hands, heart, mind, and community. 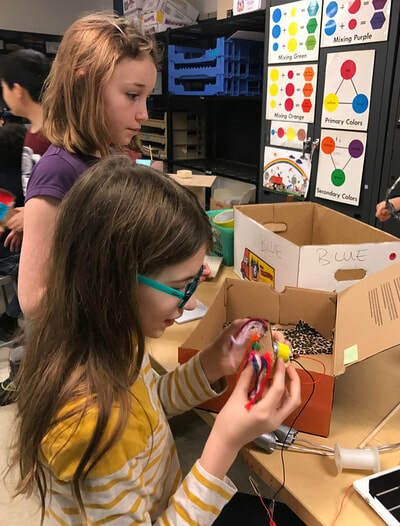 Vanna and Abigail connect elements of their sculptures, leaving a spot in which to insert the solar panel. 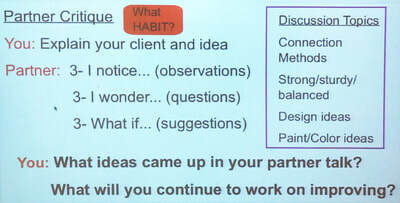 Celia shows guidelines for partner critiques. 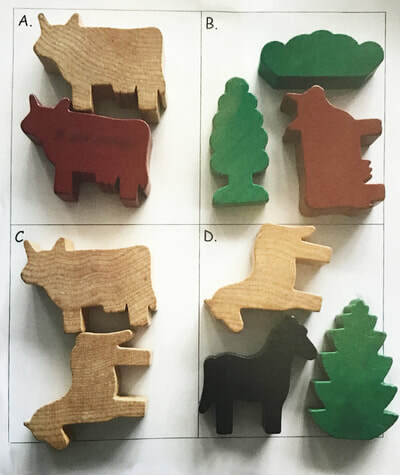 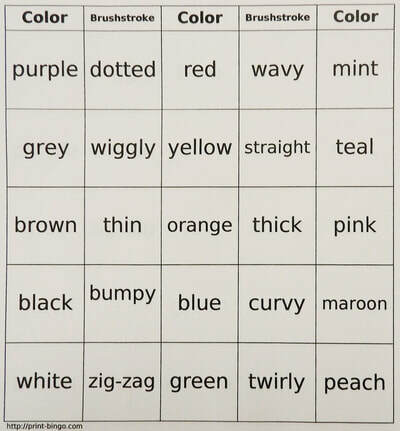 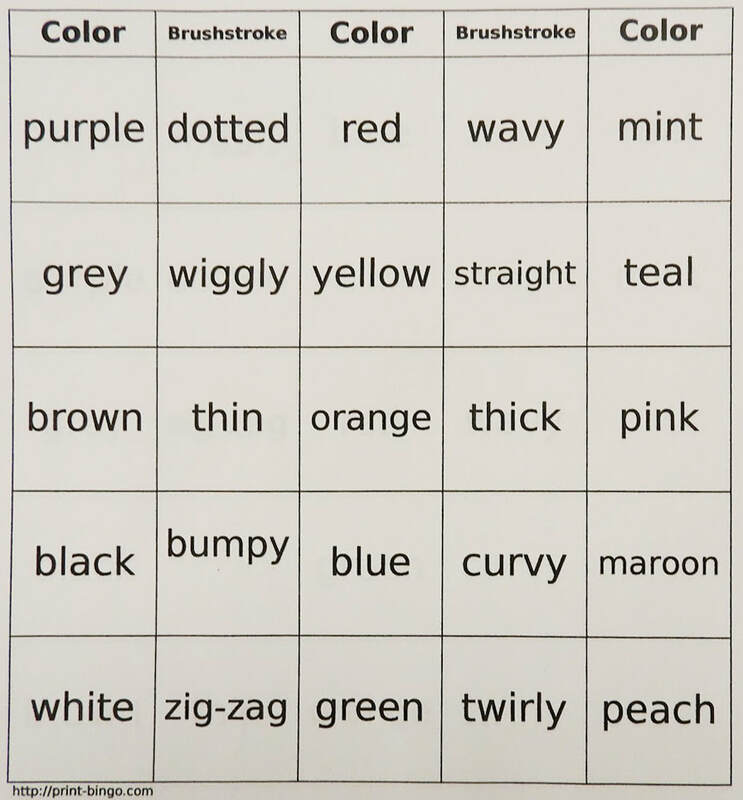 An example of a Bingo card. 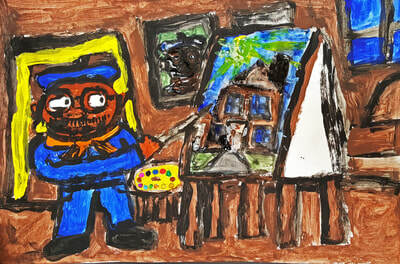 First grader Johann counts the number of colors he used in his work, a depiction of a Pokemon character. 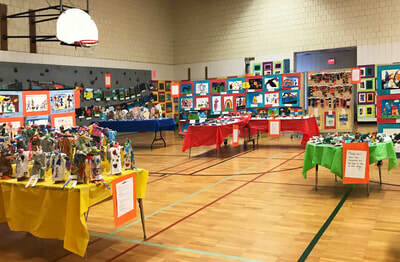 Art displays transform the gymnasium. 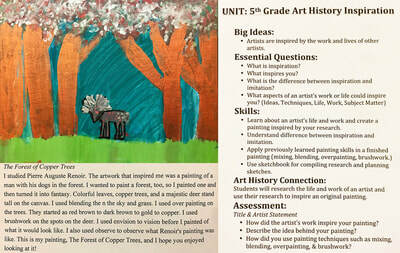 Fifth grader Elise’s artwork and artist statement are displayed alongside learning goals created by Celia. 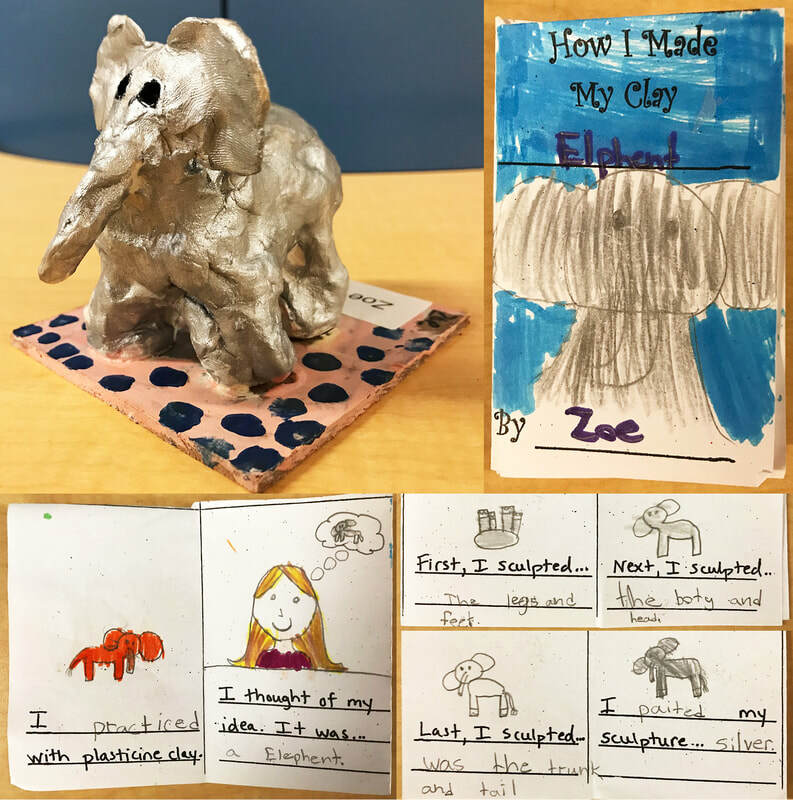 Second-grader Zoe’s elephant sculpture is displayed alongside a book that describes how it was created. Kitty and Aiden discuss his artwork. 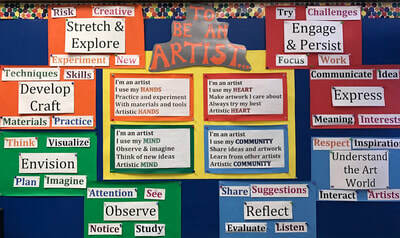 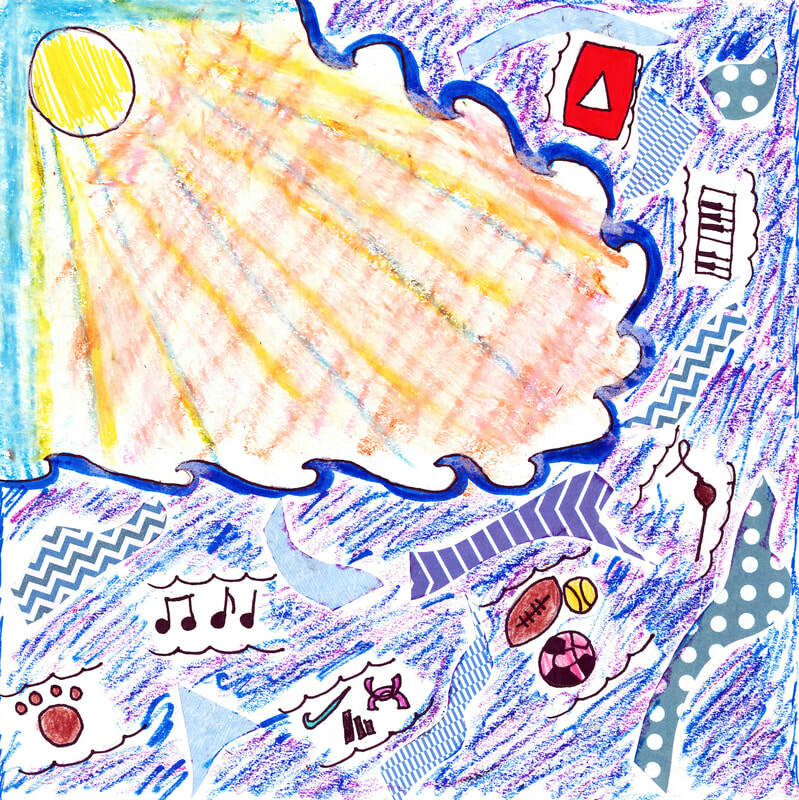 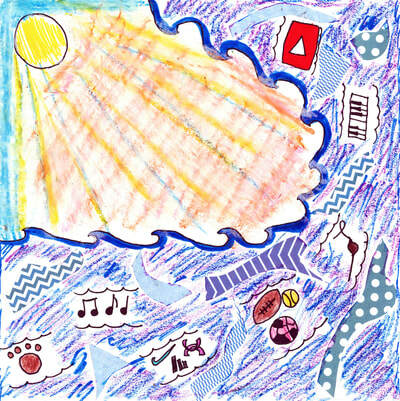 Kitty’s wall includes a list of different sources of inspiration for choosing art topics. 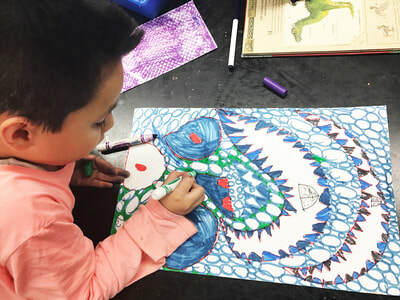 Gael works on his drawing of a dragon up-close. To the side is a book he uses for references and a purple texture rubbing of what look like scales. 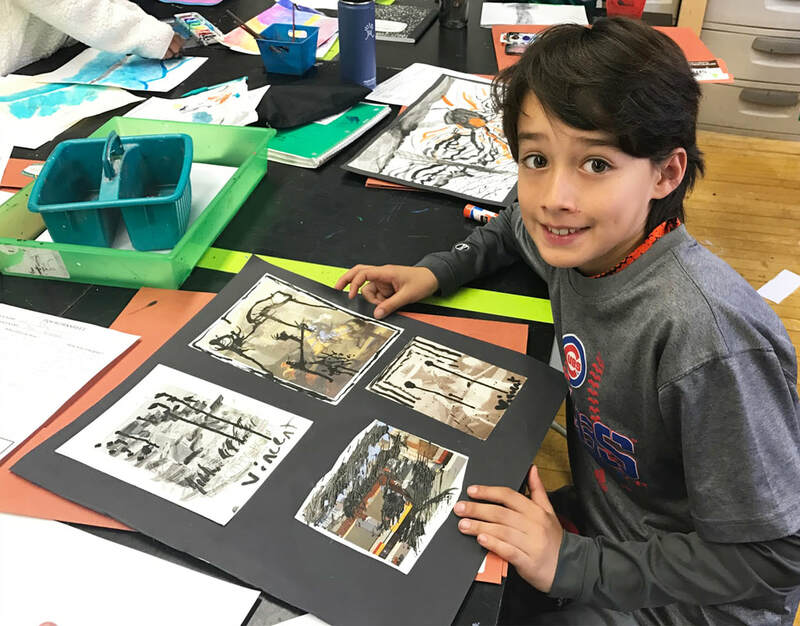 He considers displaying both to make a series. 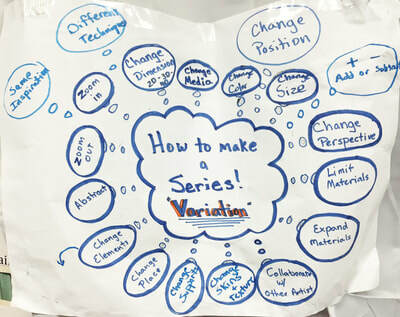 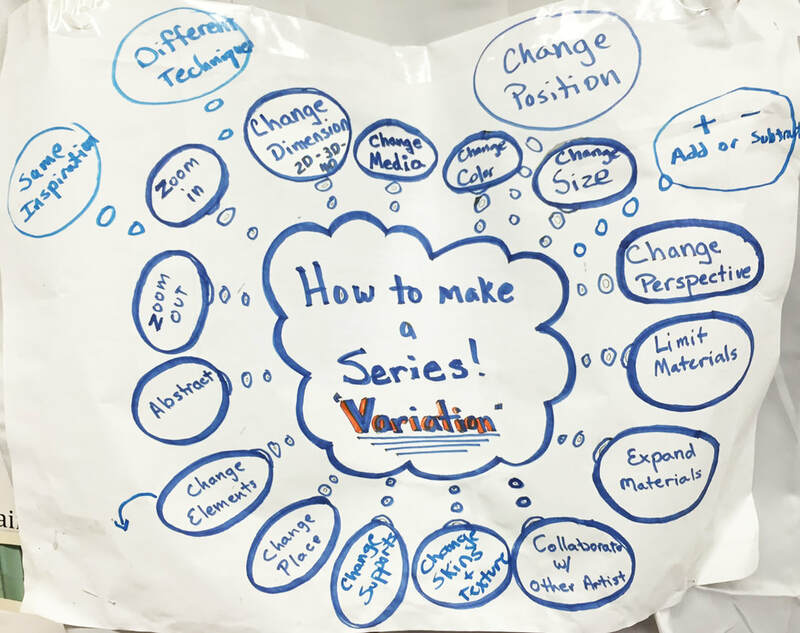 Kitty displays a reference poster of ideas for expanding a work into a series. Kitty and her students think about how they can build upon work they’ve already done. 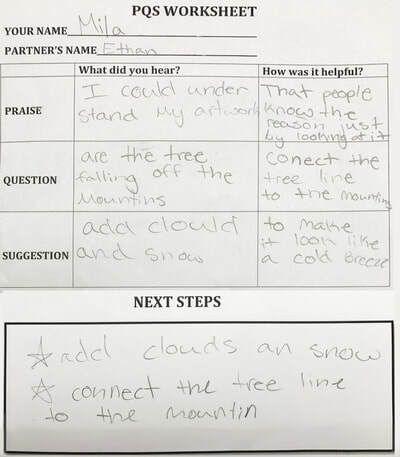 Mila fills out her PQS, interpreting her feedback from Ethan. 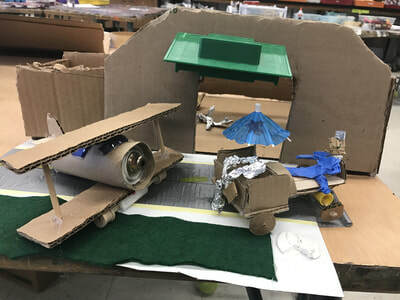 Ben’s airport sculpture includes a hanger, runway, plane, attendants, and cargo trucks. 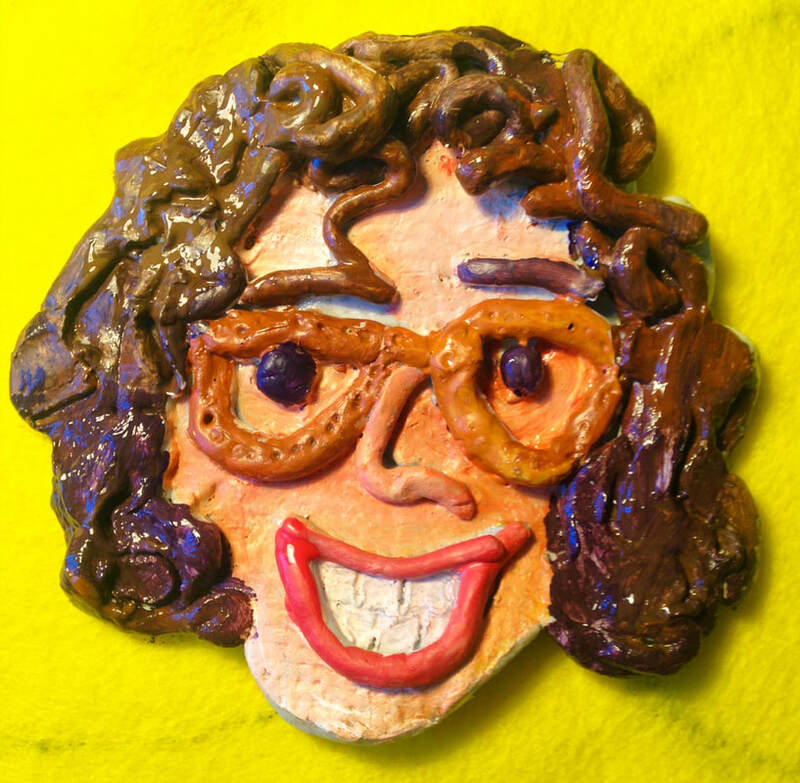 Nicole’s self-portrait in clay and paint. 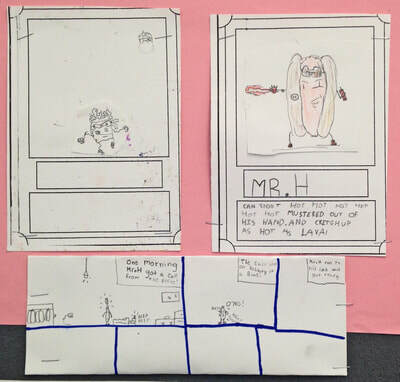 An in-progress work of the trading cards and comic about Mr. H, a hot dog who protects by shooting lava hot ketchup and mustard. 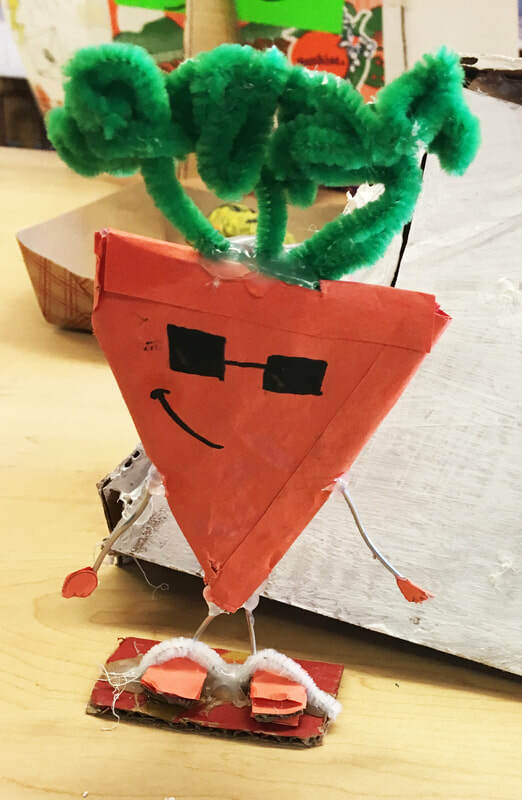 Carrot Guy went through several revisions by a student in order to stand upright. 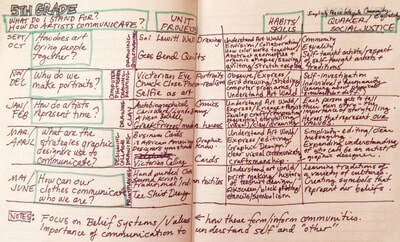 Nicole uses visual mapping to help herself make sense of her plans. 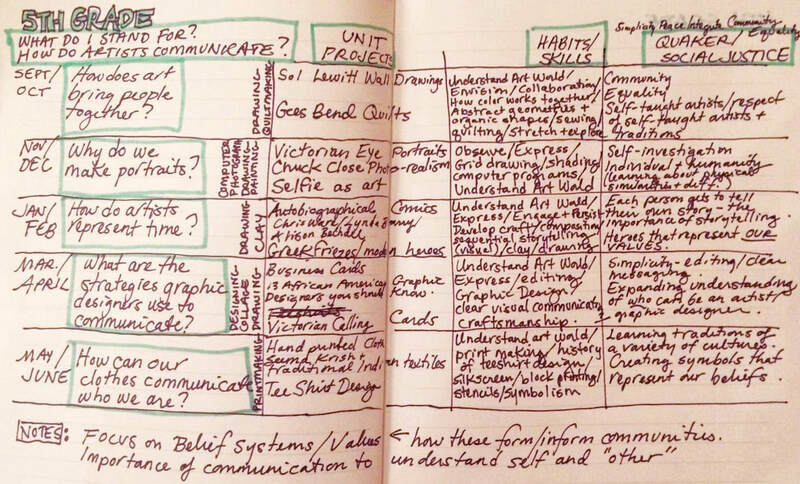 An accommodation checklist Nicole uses for some of her students. 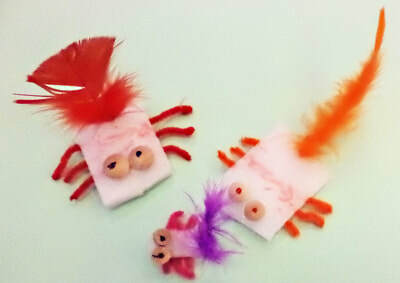 Nicole makes trading cards of her own egg characters to exchange with students. Wynita Harmon addresses her class. 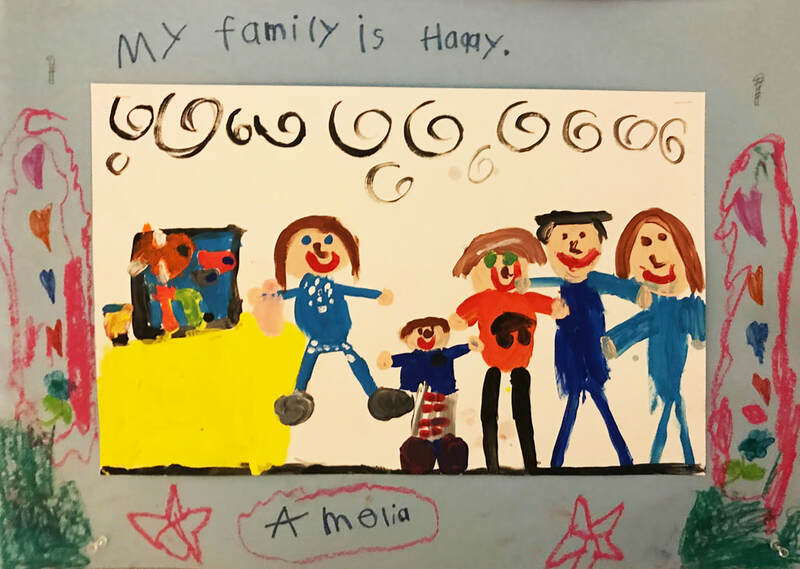 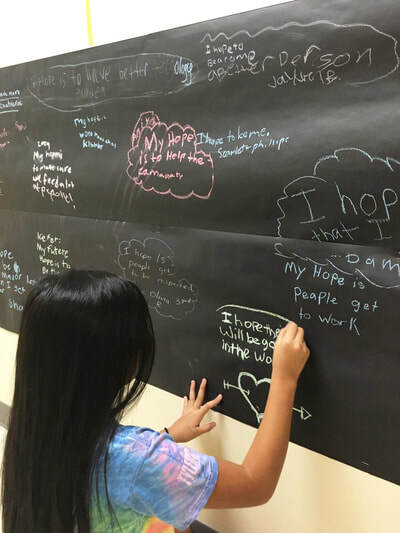 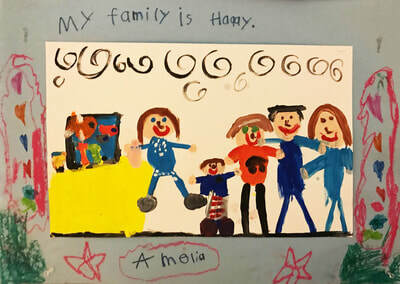 Students share their hopes on a community-themed bulletin board. 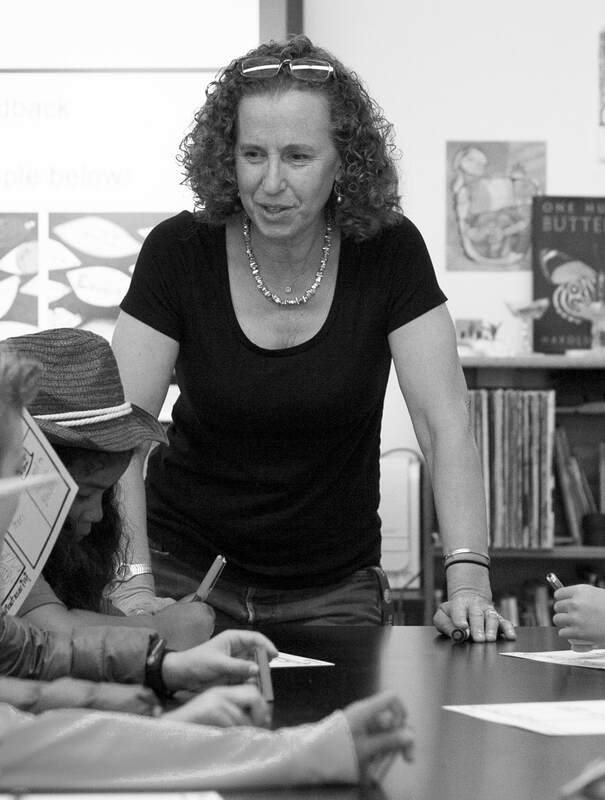 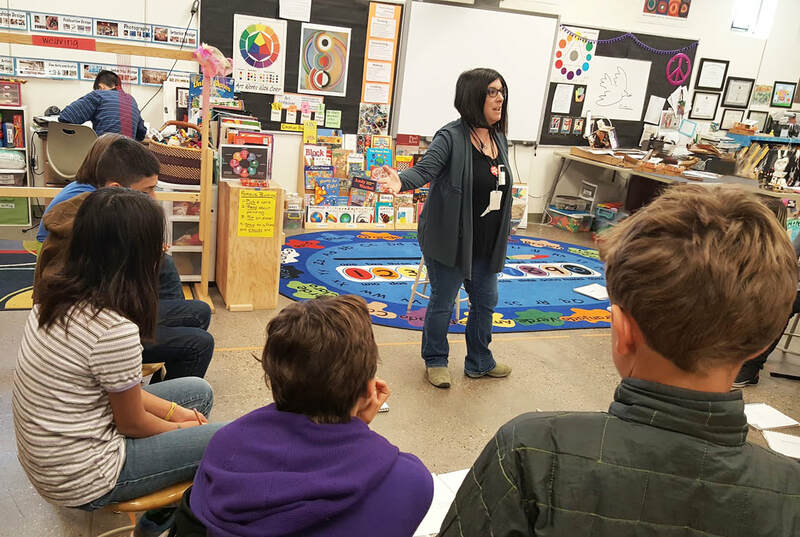 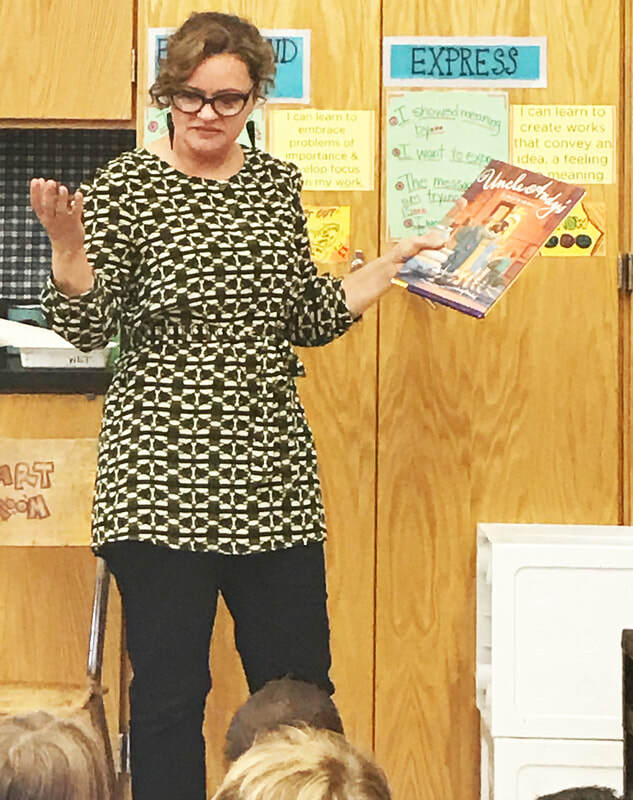 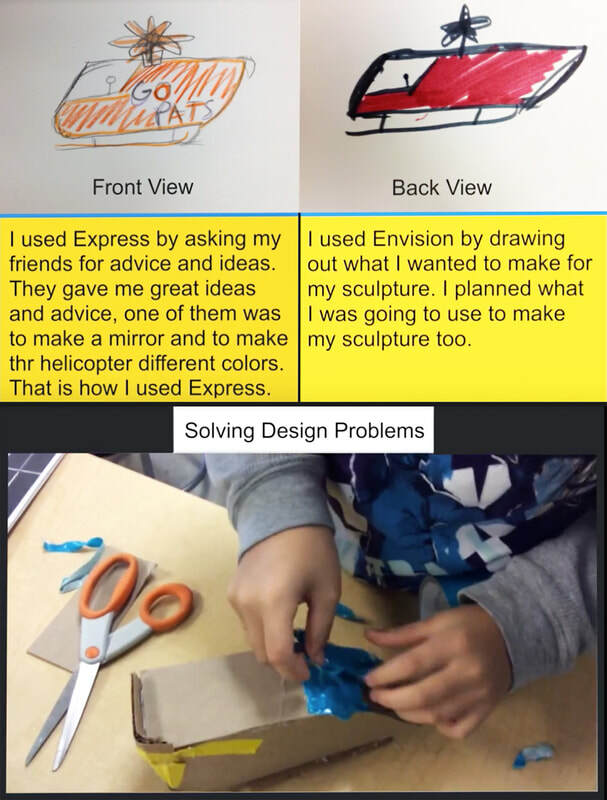 Caren talks with her students about their ideas. 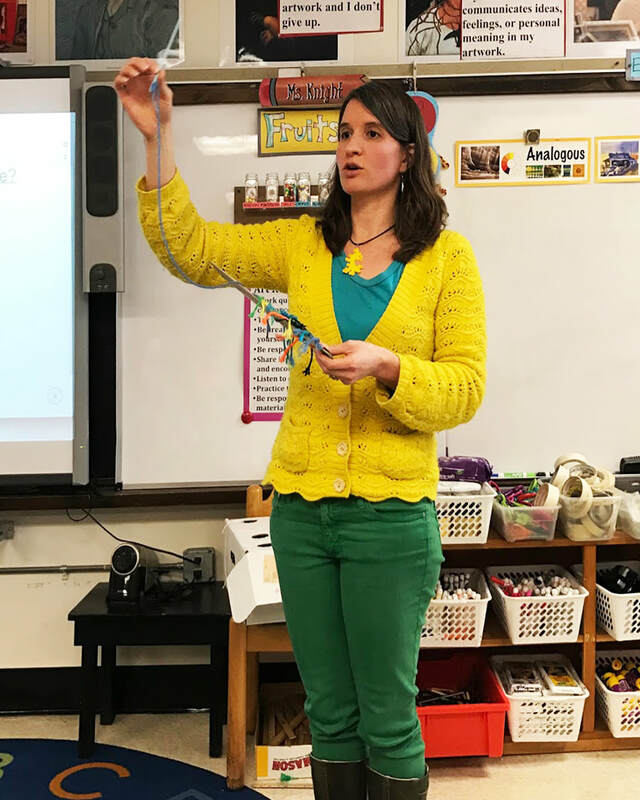 Jennifer reflects on her teaching practice. 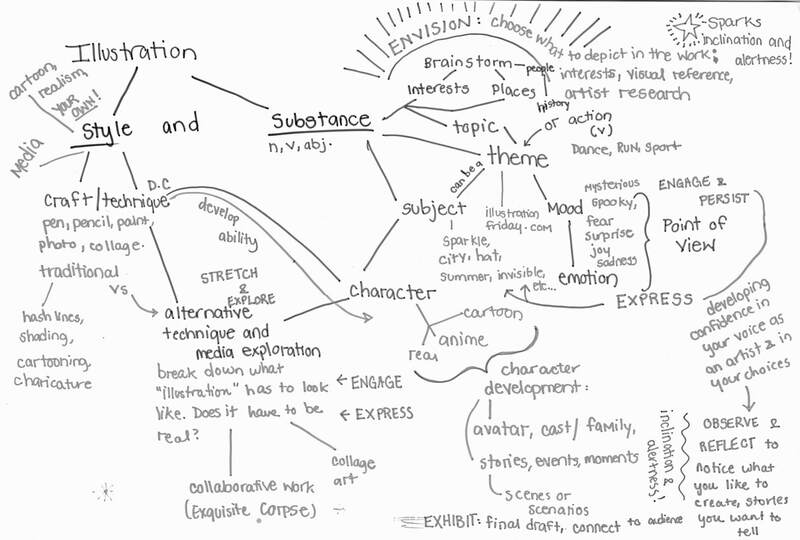 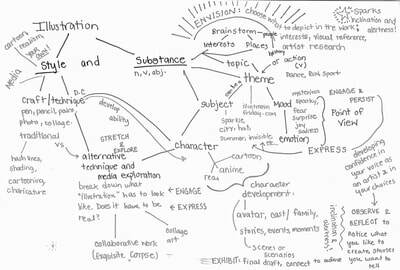 Jennifer’s map for 5th grade identifies through lines, essential questions, media, habits/skills, and social justice. 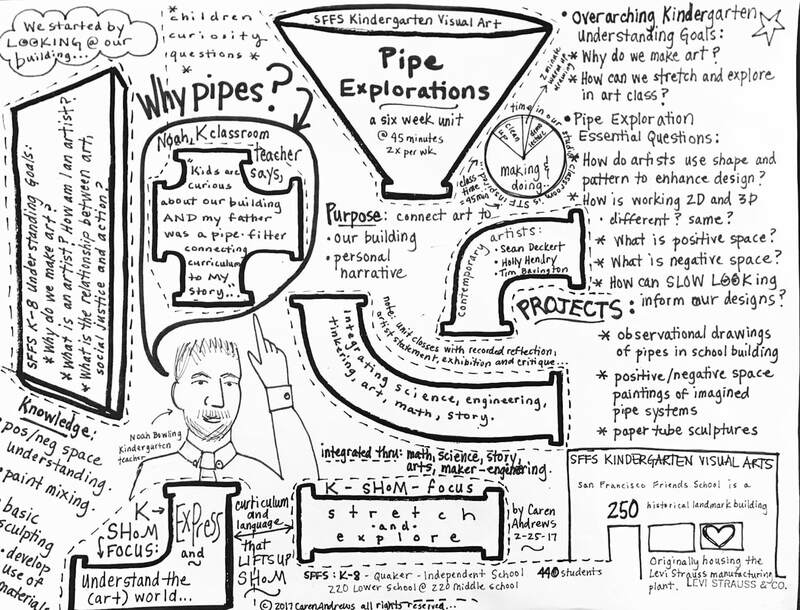 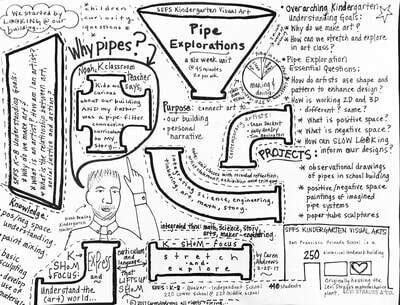 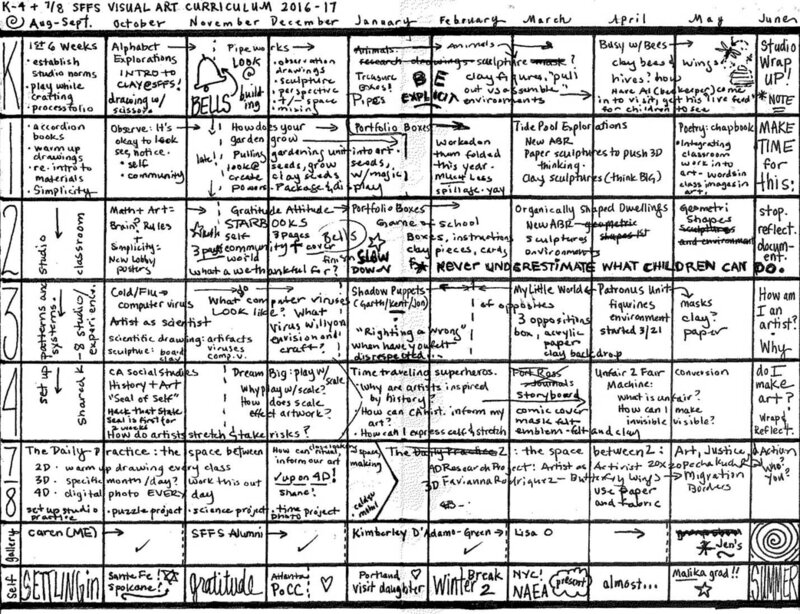 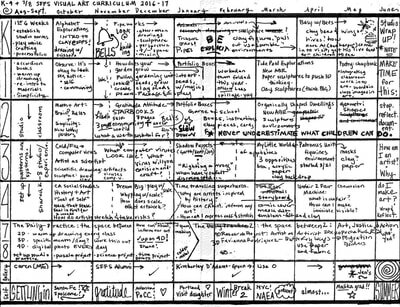 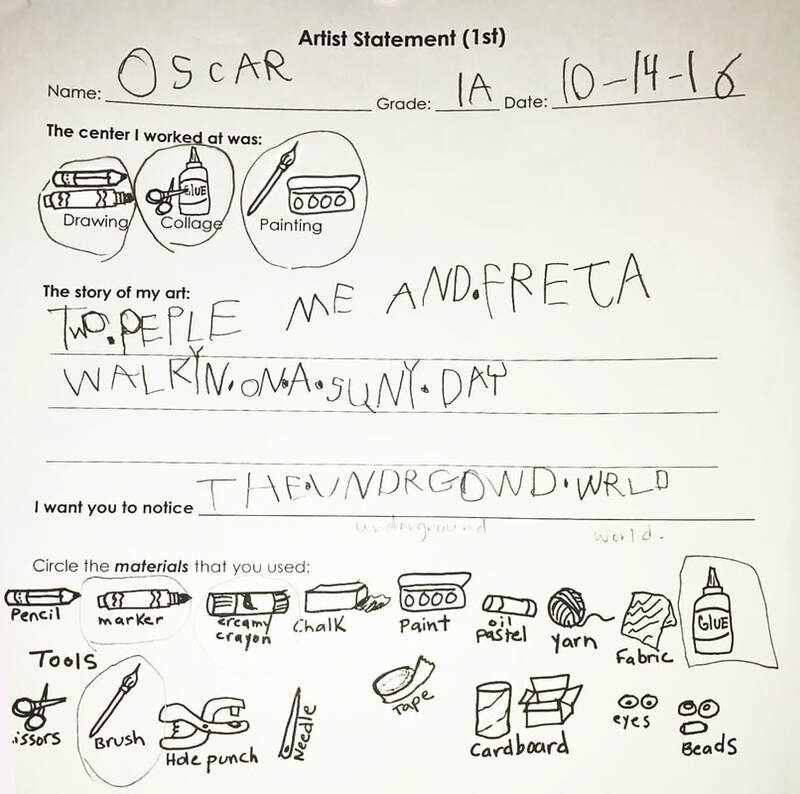 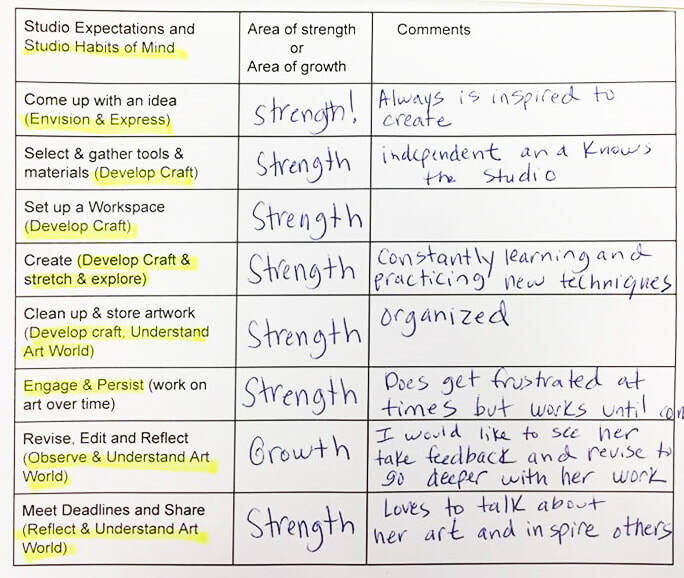 Caren’s unit plan illustrates concepts, understanding goals, and Studio Habits of Mind for a 6-week kindergarten unit, Pipeworks. A kindergarten student observes positive and negative space in her artwork as she paints the background around pipes. 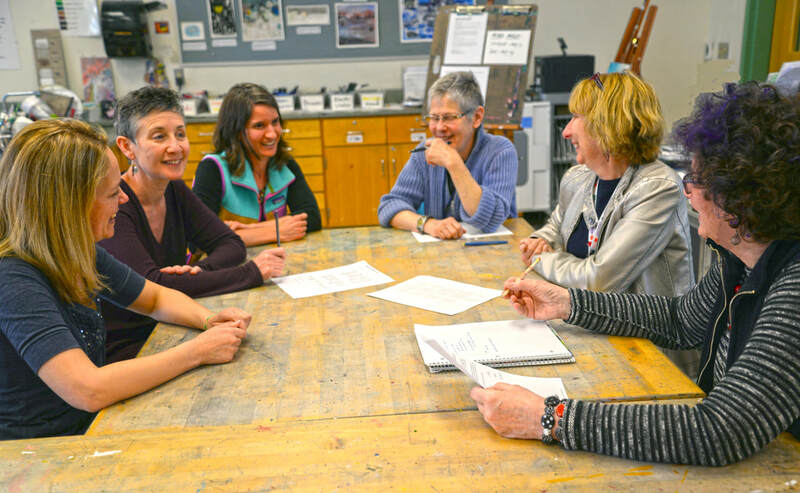 Acton-Boxborough teachers, Beth, Heidi, Celia, Anne, Eileen, and Diana, meet to talk about Studio Habits. 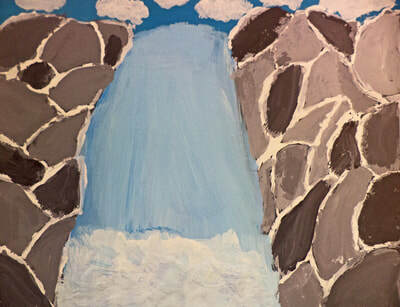 Kelly’s painting of a waterfall. 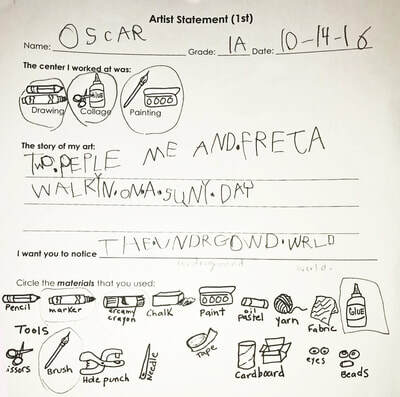 Greta’s solution to the Attachment Test is a family of creatures. 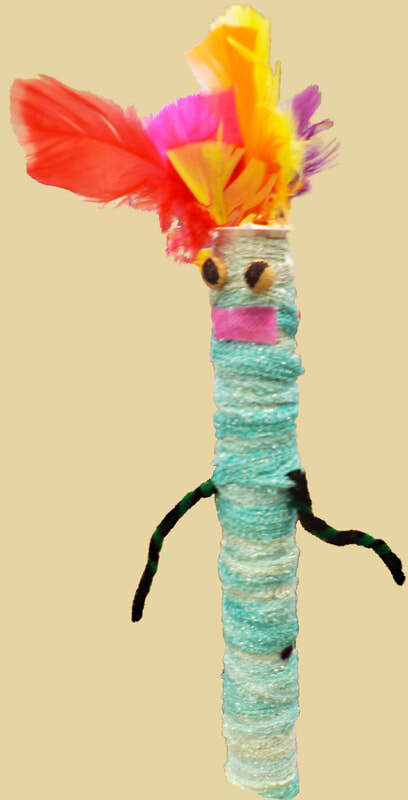 Greta explores wrapping with yarn to attach materials to a stick character. 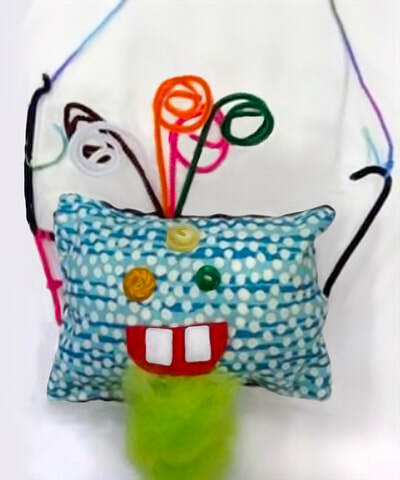 Greta expanded her fiber arts skills to include sewing to make a pillow character. 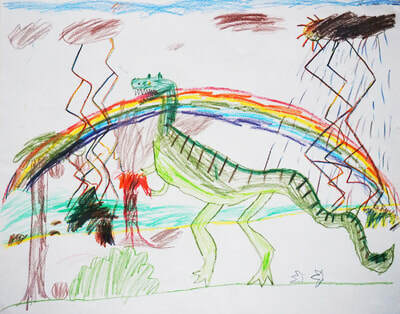 In first grade Kai drew a dinosaur from observation and then added weather elements. 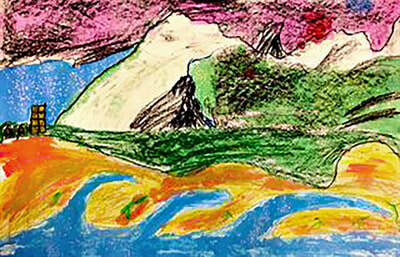 Kai spent several classes working on this multimedia drawing of an avalanche. 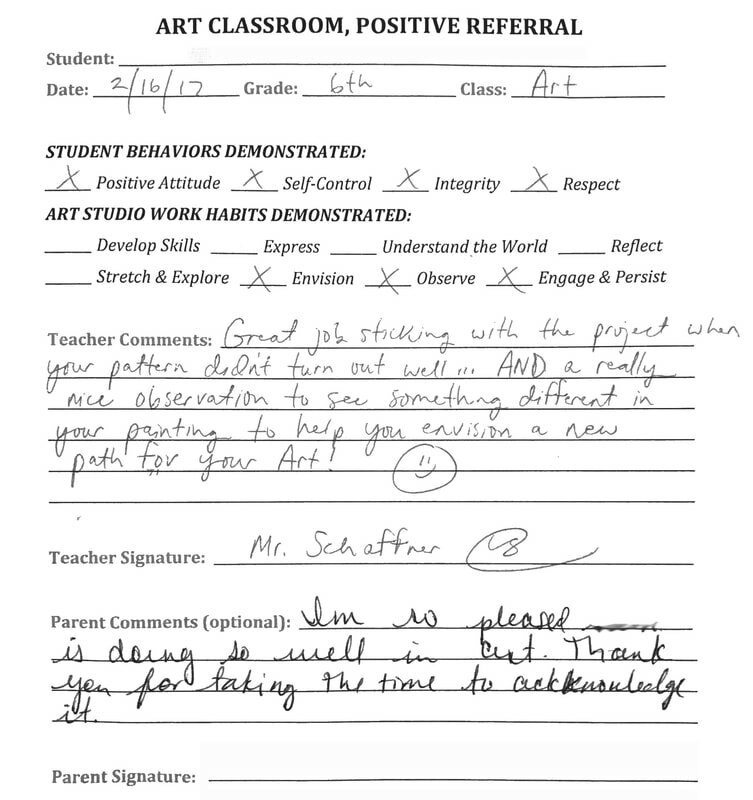 Steve Schaffner sends home a positive referral to highlight students Studio Thinking accomplishments. 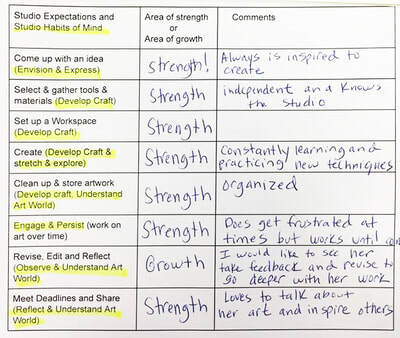 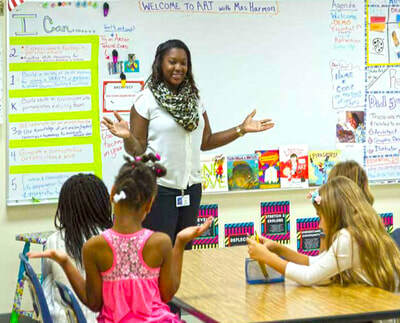 A one-point rubric identifies a student’s strengths and areas of growth. 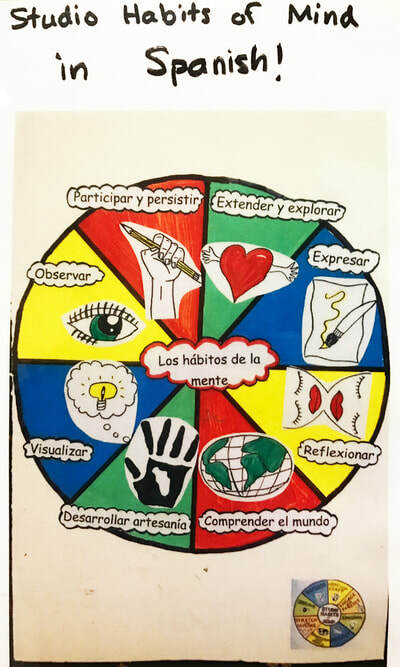 The Studio Habits are displayed in Spanish for parents who need or prefer a translation. 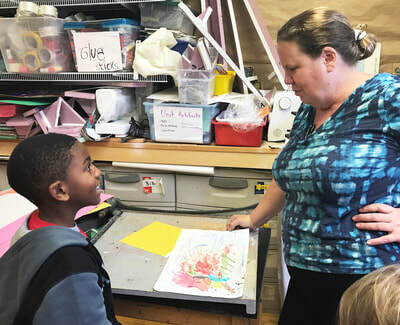 Art teacher Constance Moore and first grader Greyson discuss his sketch. 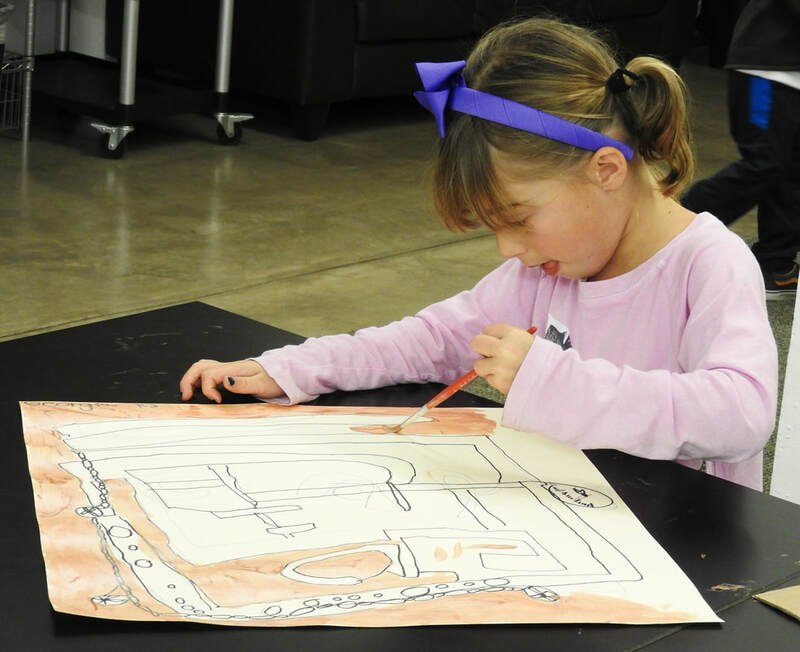 Serafina enthusiastically describes her artwork, centered on the preservation of bees. 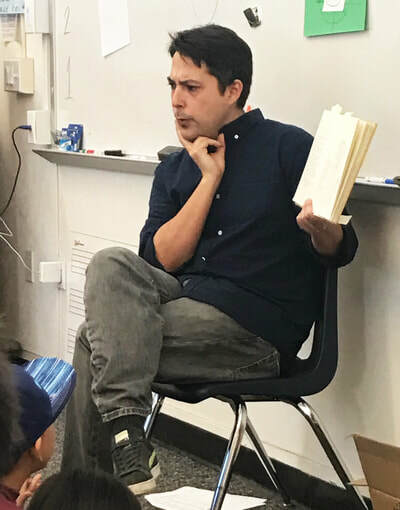 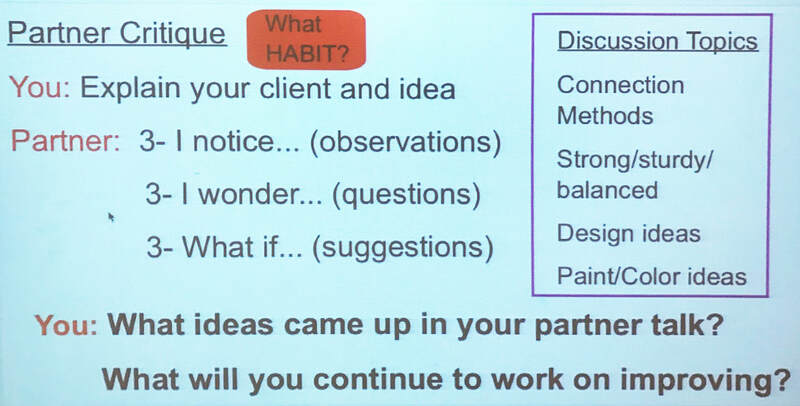 Brian Dodson uses sentence stems and prompts about each Studio Habit to reflect on class activities. First graders observe differences and similarities. 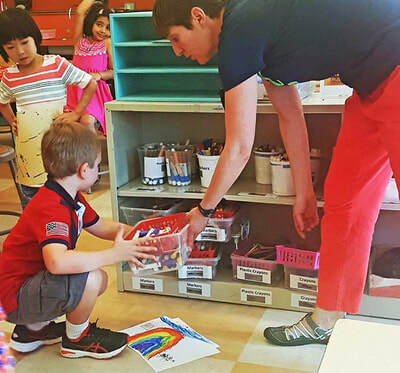 First-grade teacher Emily Roberts and Ronan talk about his shapes.